From tame topicals to designer trees, there's something for every mom. The rose and vanilla gummies from PLUS are gluten-free and kosher. More and more parents are making an informed, adult choice to responsibly use cannabis. Out on the soccer fields on Saturday mornings, I hear stuff like, "I've been thinking about it, and it's time I got back into weed." 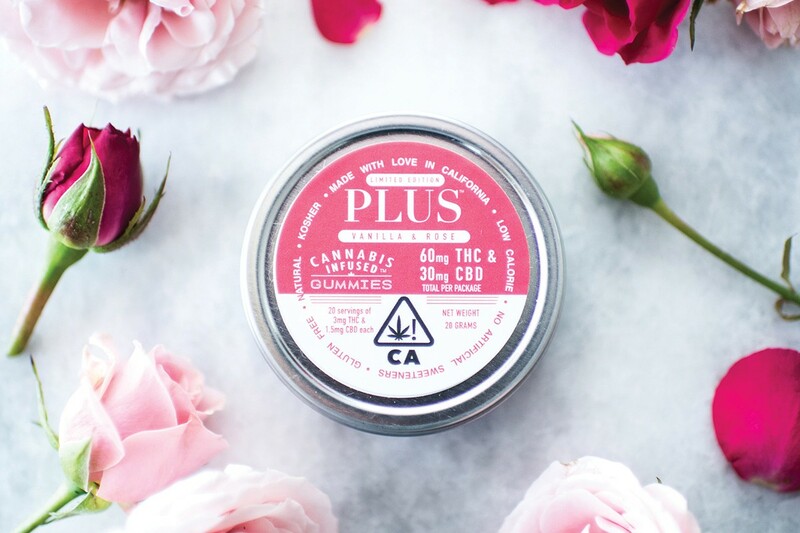 As Mother's Day approaches this weekend, we passed the mic to the moms leading the cannabis conversation in California for their bullet-proof ganja gift ideas. All of them pair well with a handwritten card, flowers, and some time spent together. Cannabis has shed its reputation as a young dude's skunky vice. The wellness market is much bigger and it's only growing. For some moms, weed makes them feel weird, clashes with their lifestyle, or delivers an inconsistent experience. The wellness market is solving that. Eloise Theisen, an East Bay certified nurse practitioner and mother of two teenagers, said she would like "a cannabis-inspired spa day with a massage or soak in cannabis-infused topicals/balms in a cannabis-friendly consumption space. The ultimate relaxation." Many of those experiences have arrived. Kirsten Merit of the marketing agency EVB Oakland notes that you can get a CBD oil-enhanced massage at the St. Regis hotel (starting at $255) and Kabuki Springs & Spa (starting at $160) in San Francisco. "But a Prana oil massage from Mistie Noela'aokalani Kent Jung [$90, mistie.jung@gmail.com]would also be amazing!" Can't afford a massage? Just buy the supplies. Cannabis topicals don't carry a head high, but users report they can help manage nerve and muscle pain. There are roll-on topicals from Prana ($30, ShopHarborside.com), as well as CBN Gel Pens for sleep and pain and THC-A transdermal patches, both from Mary's Medicinals ($60, MyBPG.com). The concept of taking cannabidiol as a daily supplement is taking off. Hilary Morse, founder of H. Hemp Company, said she'll start Mother's Day with some of her own Lemon Tincture ($69.99, HHemp.com) and a few sprays of Breath Blast ($24.99, HHemp.com). Massages, topicals, tinctures, capsules — we're just getting started. Extremely mild teas are also trending. Amanda Jones, co-founder of Kikoko cannabis-infused herbal teas, said she's looking forward to "a candle-lit bath with a cup of Sympa-Tea [$60, MyBPG.com] and the door closed!" For the moms who like a little lift when the weekend arrives, try a yoga class and a Sour Dream vape pen from Oakland maker Chemistry ($70, GetSava.com), said Laurie Light, a mom who will lead a "Women, Healthy Sleep Habits and Cannabis" meet-up in Walnut Creek on May 20. "There really is something for every mom." This is definitely the year of the portable, chic, and discrete AF vape pen. Luxury brand Beboe has lovely gift packs of mints, a "downtime" indica vape pen, and a sativa "mini" ($80, BayAreaCraft.org). OK, let's be real here — some mothers burn one down! They've achieved cannabis integration, and it can beat the heck out of Valium, Xanax, and wine. For the real cannabis matriarchs, 2018 is the best of times. For Club Sport workout buffs like Light, Somatik Sparks' low-dose, 3 mg THC Cacao Coffee Beans ($19, GetSava.com) are great for pre-gaming. Huzzah. After dinner, serve your queen potent, tasty, and designer Alien Labs Do-Si-Do Punch ($50, BayAreaCraft.org); exotic, pungent, and passionate Forbidden Fruit ($40, MyBPG.com); or Gelato ($50, WeedMaps.com/dispensaries/cookies-sf). Moms also love gummies from PLUS ($20, GOE.menu). Light recommends the Garden Society Bright Blooms ($30, GOE.menu) for balancing mood. And don't forget chocolate! Merit requests "a supply of Défoncé cannabis-infused chocolate bars [$25, GOE.menu] — maybe green tea matcha and white chocolate to stimulate energy, since we all know that Mom is never really off-duty!" And lastly, moms want more effing dispensaries. There are zero stores east of the Caldecott Tunnel where there are hella moms. So inconvenient and not cool. Call your local councilmember and supervisor. "The bigger gift I could hope for," Theisen writes, "would be to see my community come together around accepting cannabis and allowing for better access. If it were not for cannabis, I would not be the mother, wife and entrepreneur that I am. Before cannabis, I was laid up in bed using seven different pharmaceuticals to manage my pain condition. With cannabis, I am a productive member of society ... And yet, our local community continues to block access because of ignorance and outdated information. It may be too much to ask." Award-winning journalist and best-selling author David Downs writes Legalization Nation weekly. He is the co-author of Marijuana Harvest (2017). Find more Mother's Day gift tips on his podcast website, TheHash.org. Cannabis businesses say the city’s high tax rate could force them to close. But if Oakland lowers the tax, it might not be able to afford city worker raises. After a year plagued with challenges and slow progress, equity applicants are learning to manage expectations and lean on others for resources and support. Can the State Help Oakland's Equity Program? Oakland's cannabis program has come under fire for not providing enough funding to equity participants. But a new $10 million state fund could help solve some of the city's problems. Gift ideas to upgrade the farmer, the one-hitter, and the hash enthusiast. Tour a Mendocino winery and weed farm, kick back at a private Barcelona hash bar, or visit your local nursery.